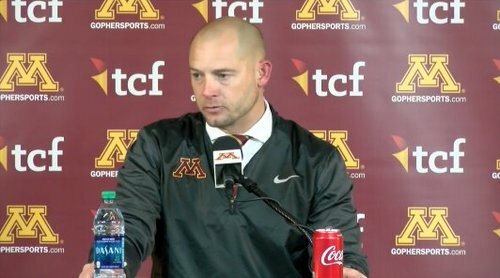 Coach Fleck and student-athletes are live on Facebook with today's post game press conference. #Gophers use final timeout with 4:08 left. Northwestern faces fourth-and-5 from its 27. Gophers get ball at their 35 with 4:01 left. #Gophers call second timeout after 2-yard gain, 4:13 left. #Gophers call timeout with 4:18 left after 1-yard gain by Bowser. Northwestern takes over at its 22 after kickoff. #Gophers Morgan connects with Johnson for 6-yard TD with 4:32 left, cutting Northwestern lead to 24-14. 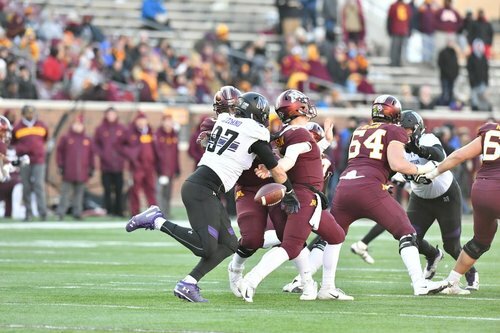 Northwestern LB Nate Hall ejected for targeting on head-to-head hit on #Gophers QB Tanner Morgan. Gophers have ball at Wildcats 6, first-and-goal. #Gophers QB Tanner Morgan hits Tyler Johnson for a 10-yard TD pass, but play is wiped out by illegal hands to the face penalty on Mohamed Ibrahim. Joe Gaziano is a game changer. Fact. #Gophers force Northwestern to try 29-yard field goal. Jake Collins' kick is good, boosting lead to 24-7 with 7:49 left in fourth quarter.